Our Enterprise Risk Management Advisory Board members are distinguished leaders in the field. Their role is to advise and guide the academic content of the certificate and courses. Norman Abrams served as Acting Chancellor of UCLA in 2006-2007. Retiring from the Law School faculty in 2007 with the titles of Acting Chancellor Emeritus and Professor of Law Emeritus, he was recalled and continues to teach and write in the areas of federal criminal law, anti-terrorism law and evidence. The fifth edition of Abrams’ groundbreaking casebook on federal criminal law, Federal Criminal Law and Its Enforcement (with Beale and Klein), was published in 2010. Another of his books, Anti-Terrorism and Criminal Enforcement, (3rd ed., 2008), is the first casebook to deal comprehensively with the rapidly evolving field of anti-terrorism law and the criminal enforcement process. Abrams holds A.B. (1952) and J.D. (1955) degrees from the University of Chicago, where he was editor-in-chief of the University of Chicago Law Review. Before joining UCLA, he served as an associate in law at Columbia University Law School and as a research associate, and served as Director of the Harvard-Brandeis Cooperative Research for Israel’s Legal Development at the Harvard Law School. While on leave from UCLA in 1966-67, he served as a Special Assistant to the Attorney General of the United States in the Criminal Division of the U.S. Department of Justice. James Featherstone has over two decades of experience in emergency management and fire prevention with the City of Los Angeles Emergency Preparedness Department. An alumnus of the National Fire Academy, he has worked for nearly 20 years at all levels of the Los Angeles Fire Department (LAFD); in leadership positions within the United Firefighters of Los Angeles; in service in the United States Navy; and as Interim Assistant General Manager of the City’s Emergency Preparedness Department. Mark Kroeker began police career with LAPD in 1965, rose to the position of Deputy Chief of Police and subsequently became Chief of the Portland Police Bureau in Oregon. His international contributions are also substantial: United Nations Deputy Police Commissioner in Bosnia and Herzegovina (1997), United Nations Police Commissioner in Liberia (2003), United Nations Police Advisor in the U.N. Department of Peacekeeping Operations (2005-2007), member of the American-Israeli-Palestinian Anti-Incitement Committee, a team designer of the reform plan for the Haiti National Police, contributor to police development projects in Rwanda and Burundi, and the Founder of the World Children’s Transplant Fund. Mark holds an M.S. in International Public Administration from USC. Elsa Lee: CEO and founder, Advantage SCO, LLC. A provider of corporate, homeland, and national security services to government and private industry, Elsa Lee has worked closely with the FBI, CIA, Secret Service, National Security Agency, Mi-5 in the U.K. and Germany’s GSG-9. She is trained in U.S. , British, and Israeli counterintelligence and counterterrorism. Lee wrote Homeland Security and Private Sector Business and is a frequent resource for CNN, Fox News, CBS, Voice of America, and Canada Business Channel. As Bureau Chief of the Port of Los Angeles, Paul Lipscomb is responsible for is one of the largest ports in the world As the leading container port in the nation and a critical hub in the international supply chain, the Port generates 259,000 regional jobs and $8.4 billion in annual wages and tax revenues. Previously Paul Lipscomb’s held leadership positions in the United States Secret Service in the areas of investigations, intelligence and tactical operations. He recently served as the Assistant Federal Security Director for the Department of Homeland Security. Jana Monroe is the director of corporate security for Southern California Edison (SCE), headquartered near Los Angeles. SCE is one of the nation’s largest investor-owned electric utilities, providing power to 13 million homes and businesses within 50,000 square miles, encompassing 11 counties in central, coastal, and southern California. Monroe oversees the personal security of 18,000 employees through background checks, badge and access control, threat management, work place violence prevention, incident investigation, and executive protection, at home and abroad. Dr. Myers is the content specialist for the Readiness and Emergency Management (REMS) Technical Assistance (TA) Center. Previously, he served as Save the Children’s emergency preparedness lead in the United States. He also held various levels within the American Red Cross, including being the educational lead for the Preparedness department at the National Headquarters and a Director of Emergency Services. Paul graduated from UC Santa Barbara with a PhD in Communication where his research combined health communication and mass-media persuasion in the context of health threats, emergency management and counter-terrorism. He served as a police constable with London’s Scotland Yard before immigrating to the U.S.
Scott Nelson founded SRMG in 2002, a national security consulting firm to Fortune 500 companies. After retiring from the FBI, Nelson served as vice president of security for Warner Bros. Studios, overseeing the security, fire, emergency services, investigations, and medical services departments. He has also been a senior security executive for Time Warner Inc., responsible for global, multinational security operations for the largest entertainment company in the world. Nelson led the firm’s 9/11 corporate response team in New York City. He is currently an adjunct professor at the School of Business & Technology (SBT) at Webster University, in St. Louis, teaching graduate classes in organizational behavior and management, psychosocial criminal behavior, ethics, protective security law, business asset protection, and criminal policy, practices, and procedures. Gabriela Noriega, PhD, is an emergency management coordinator for the City of Los Angeles Emergency Management Department. She is experienced in emergency planning, social vulnerability analysis, and hazard identification and risk assessment, as well as statistical analysis and Geographic Information Systems (GIS). Dr. Noriega received a bachelor’s degree in geology and earned a master’s while researching the San Andreas fault. She received a doctorate in environmental analysis and design from the UC Irvine, with studies on understanding the social vulnerability to earthquake risk. In his senior Metro position, Scott Norwood works exclusively in emergency and homeland security preparedness and leads Metro’s emergency preparedness program. He is the current chairperson of the Southern California Transit Safety & Security Forum, addressing regional transportation safety, security, and emergency management issues. Norwood is also a member of the Los Angeles Operational Area Alliance, which advances regional preparedness, and belongs to the California Emergency Services Association and the International Association of Emergency Managers. He previously was a law professor, focusing on complex civil, liability, and emergency legal issues in the private sector. Lauren Ohl-Trlica is an emergency management specialist who has worked in leadership positions with the UCLA Office of Emergency Management and the Arlington County, Virginia, Office of Emergency Management as their training & exercise coordinator. Additionally, she has taught emergency management technician courses at UCLA and George Washington Universities. While earning her master’s degree in crisis, emergency and risk management from George Washington University and her bachelor’s in physiological science from UCLA, she earned three scholarships and one fellowship. Gigi Ragusa is jointly appointed at USC in the Rossier School of Education and Viterbi School of Engineering’s Division of Engineering Education. Her recent responsibilities included acting as the principal investigator on federal grants through the U.S. Department of Education and the National Science Foundation. Gigi Ragusa has extensive experience in distance learning, and has held faculty positions with University of California (Northridge) and Pacific Oaks College. Devra Schwartz has extensive experience in emergency planning, response, training, and exercising. She also has managed grants and created grant-related reports, managed multi-disciplinary projects including the private and public sectors and multiple jurisdictions. She has conducted detailed analyses of systems, program models, and implementation plans; authorized organization and project strategic plans; and generated substantial growth in market share by developing creative strategic plans and organizational partnerships. Phillip Van Saun is director of risk, security and resilience for the University of California Office of the President. He is a graduate and former instructor of the national interagency crisis communications program and the White House Military Office’s executive support program. Phillip has served in the field of emergency and crisis management since 1987 when he was a Marine assigned to Marine One – the Presidential Helicopter Squadron. Following military service Phillip served as a consultant to the White House Military Office providing emergency response training to White House support personnel. In 1990 Phillip was awarded the Presidential Service Award for his service in the White House. 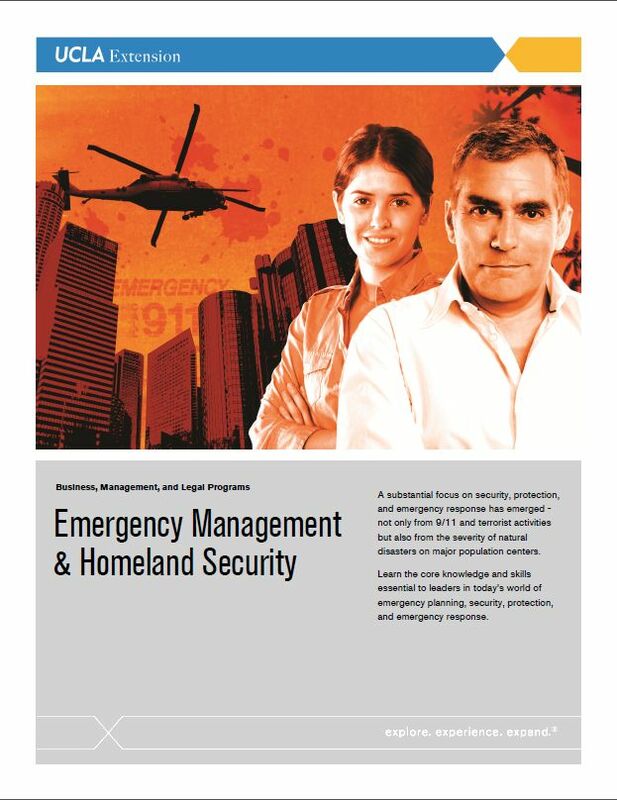 Phillip is a board member of the Higher Education Case Managers Association and the UCLA extension Homeland Security and Emergency Management certificate program. He holds an MA in communication from Trinity University and completed the executive program in crisis management at Harvard University and the scenarios program at Oxford University. He is the author of Failure Is An Option: A Primer and Guide for Managing Crises.